1. Login to your School Loop account and click SiteCenter under the Toolbox menu. 2. At the insert module screen, select the "Showcase" tile. 3. A Showcase module will appear on the page. 4. 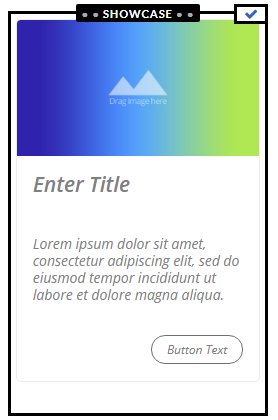 Add an image by dragging and dropping onto the placeholder image in the module. Alternately, use the add image icon on the toolbar to select an image from your hard drive or one stored in your locker. 5. Edit the generic placeholder title and text. Click on the text you wish to edit and begin typing. 6. Replace the generic text in the button and then use the link icon in the toolbar to set the destination for the button. A popup window will appear. Use the tabs across the top to select the type of destination you desire. 7. Optionally, use the Format link in the toolbar to choose between the available formats.